Tried, Tested and Trusted Hardware & Software for the ideal hosted server solution. UK Datacentre with a focus on security, connectivity and support. Our network infrastructure and equipment allows us to provide you with isolated virtual servers you can deploy for any purpose. We use the industry leading VMware virtualisation technology to provide an experience you would be hard pushed to match even on physical hardware. With lots of room for expansion and options for your own private network, we really can meet your business' needs however specific they are. We operate all our own equipment and storage, we are not reselling from a larger provider which means you have a direct contact for support. 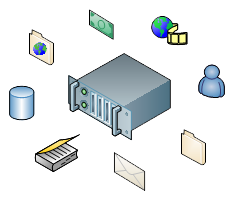 Do you have a server in production that needs converting or migrating to a virtual / outsourced platform? We can help. If you have any specific requirements for your virtual server hosting with us, just give us a call on 02476 382031 and we will be happy to put a solution together for you. We offer a full range of specifications, server operating systems and network configurations. Our base package starts at just £67/month, give us a call or drop an email over with your requirements and we can compile a custom quotation for you. We also offer quick turnaround for those businesses needing to get up and running right away. Give us a call on 02476 382031 or drop us an email from our contact page.